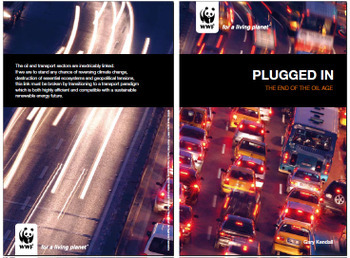 The report, Plugged in: the End of the Oil Age, considers the future of a global transport sector that is currently 95% dependent on liquid hydrocarbon fuels. It examines the potential impacts and practicalities of electricity, versus other oil substitutes that could be used to fuel future transport systems. "Cars of the future must be much more efficient - smaller, lighter, more aerodynamic - and they should, increasingly, be powered by electricity."